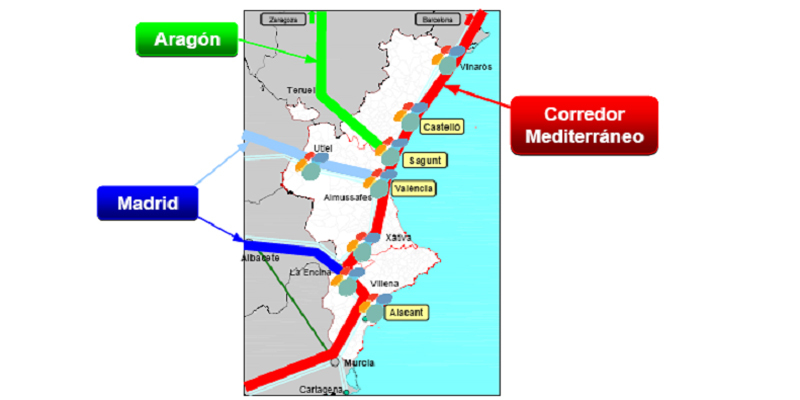 The Generalitat Valenciana is expecting the freight rail transport within its territory to be in the European average in 2020, around 17% of total freight transport. Therefore, in this work the current situation is analyzed, and measures to accommodate the traffic increasing are proposed. The purpose of the study is to determine the necessary actions to ensure that in 2020 the railway network of the Community of Valencia will be able to accommodate the traffic expected for the share of freight rail transport is similar to the European average, which is 17%. To this address it, the current situation has been analyzed firstly, studying both existing infrastructures and demand. After that a prognosis to determine the number of circulations provided in the horizon year of work has been done. The next step has been the analysis of the network capacity, in order to do a diagnosis, determining the weaknesses of it, and undertake a proposed action, focused on four programs of action (New lines provided, new terminals, access to ports and particular accesses). Finally, an analysis of the normative framework and potential management models referred to therein was performed, in order to identify potential performance models which met the existing legislation requirements.